The Caspian Sea is about as strange as a body of water gets. Its surface still sits 27.5 meters (90 feet) below sea level, and water doesn’t flow out of it—it’s isolated from the oceans, and relies on a series of Asian rivers to maintain its levels. A team of researchers from universities around the world calculated the major factors adding to changes in the Caspian Sea’s levels. The sea has risen and fallen over the past few decades as runoff, precipitation and evaporation take turns adding or subtracting from its volume. And they think that their findings, combined with the effects of climate change, do not bode well. “With continued warming in the northern hemisphere, one can expect yearly accumulated evaporation rates over the Caspian Sea to continue increasing for the foreseeable future,” they write in the study published last month in the journal Geophysical Research Letters. The researchers’ concern comes from a simple model they built to understand the data. 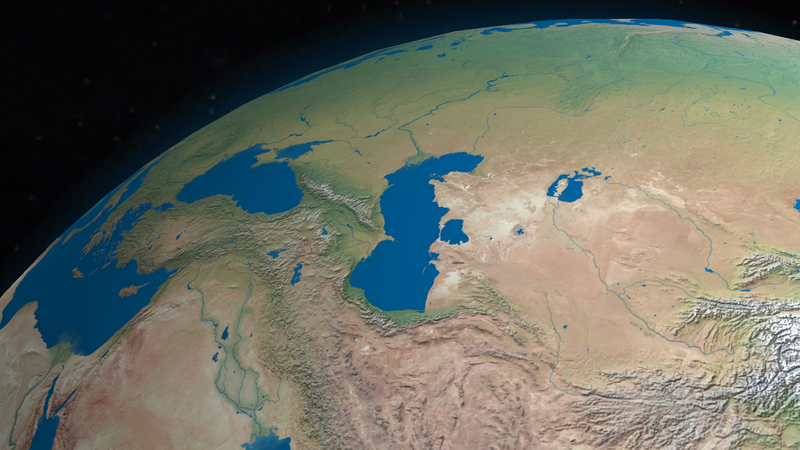 As a basin, the largest factors affecting the Caspian sea’s levels are rain, evaporation, and inflow, mostly from the Volga river but with help from others like the Ural, depending on the year. Producing their analysis required simply tallying the river discharge volumes from recorded data and filling in the blanks with other model predictions, like those from the National Centers for Environmental Prediction Climate Forecast System. All of that sums into one easy equation: The rate of change in the Caspian’s mean sea level over time is just the rate of change of precipitation plus the rate of change of river discharge, minus the rate of change of evaporation. Once they had their working model, the team compared it to the observed rates and satellite data, showing that they’d done a good job estimating the biggest impacts to Caspian sea’s level. They observed in increase of an average 13.09 centimeters per year from 1979 to 1995, and a decrease of an average 6.72 centimeters per year from 1996 until now. But the importance of their model wasn’t simply that it recreated the data. Instead, it made an important finding as to the main driver behind decreasing levels. Increased evaporation from 1979 to 2016 plays the largest part in the shrinking sea. Furthermore, evaporation is closely related to rising temperatures, a trend expected to continue with climate change. This is, of course, just a model, and what the complex planet decides to do is uncertain. After all, the sea’s levels fell and rose in response to river damming projects and other factors throughout the century, according to Natural History Magazine. The researchers also haven’t used the model to make any predictions, and it’s missing some pieces, such as the contribution from groundwater. Finally, their model veers somewhat away from the actual data from 2010 on, especially in 2011 and 2012, and they don’t know why. Shrinking seas in the area certainly be a cause for concern, though. The nearby Aral Sea was once the world’s fourth largest salt lake, but is now a mostly dried-up wasteland referred to in the past tense after the Soviet Union diverted the rivers that fed it. The Caspian Sea and its resources are of much interest to the surrounding countries, and who knows what further development could do to the region. Modeling and the data have spoken; evaporation seems to have been driving a decline in the enormous sea’s levels since 1996. But what will happen in the future, we don’t know yet.